. :: Welcome to National Heart Foundation of Bangladesh ::. 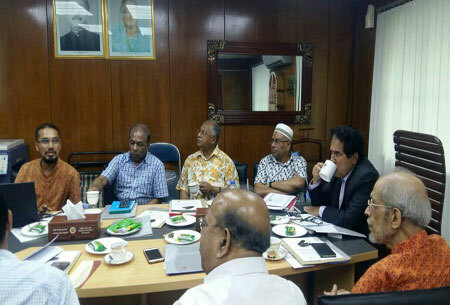 United Forum Against Tobacco (UFAT) and Bangladesh Network for NCD Control and Prevention (BNNCP) had a pre-budget meeting with Mr. Mosharraf Hossain Bhuiyan, Chairman, National Board of Revenue (NBR) on 31 March, Sunday. The delegates from UFAT and BNNCP were lead by National Professor Brigadier (Retd) Abdul Malik, Founder and President, National Heart Foundation of Bangladesh. In that meeting BNNCP and UFAT representatives demanded to increase the price of tobacco products considering the inflation and the increase in per capita income to keep tobacco products out of purchasing power of the people. Professor AK Azad Khan, President of Bangladesh Diabetic Association and Endocrine Society of Bangladesh, Professor Harun-ur-Rashid, President of Kidney Foundation of Bangladesh, Professor Mollah Obayedullah Baki, President, Bangladesh Cancer Society, Professor Golam Mohiuddin Faruque, Joint-secretary, Bangladesh Cancer Society, Dr. Nasir Uddin Ahmed, former chairman, NBR, Mr. Shariful Alam, Lead Consultant, CTFK (Bangladesh) were among the representatives of BNPNCP and UFAT. At the meeting Mr. Md. 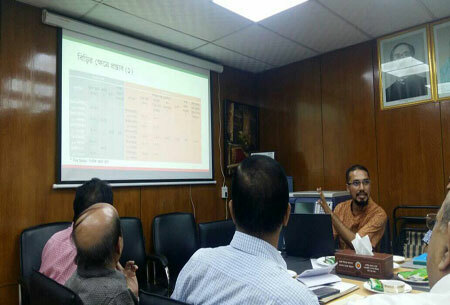 Hasan Shahriar, Coordinator, PROGGA presented the proposal on tobacco taxation through PowerPoint presentation. He said that about 1,26,000 people died due to tobacco-related diseases in Bangladesh in the year 2018. Besides, the financial loss of tobacco use (loss of medical expenses and productivity) in the fiscal year 2017-18 fiscal year was 30 thousand 560 crores, but at the same time (2017-18) only revenue amounting to Tk 22810 crores earned from tobacco products. ♦ Strengthening tobacco tax administration including stringent licensing and tracing, make punitive penalties for tax evasion. Participants of the meeting said that, according to the commitment of Prime Minister Sheikh Hasina, to ensure tobacco-free Bangladesh by 2040, tobacco needs to be taken out of the reach of the people. There is no alternative to raising prices for this. If the tobacco price increases, more revenue will be earned; then it will also be helpful in protecting public health. At the meeting NBR Chairman Mr. Mosharraf Hossain Bhuiyan said, tax has been increased in the tobacco products last year. He assured that the matter will be considered this year.